MANILA, Philippines (Mindanao Examiner / July 6, 2010) – Indonesian authorities have detained over a dozen people, including a Filipino environment activist, during a news conference in Western Java, the Legal Rights and Natural Resources Center in Manila said. “We denounce in the strongest possible terms the unwarranted arrest of Ms. Jean Marie Ferraris by misguided elements of the Indonesian police, who apparently barged into a peaceful press conference being held after a training activity organized by our friends from Greenpeace,” said Judy Pasimio, of the Legal Rights and Natural Resources Center. 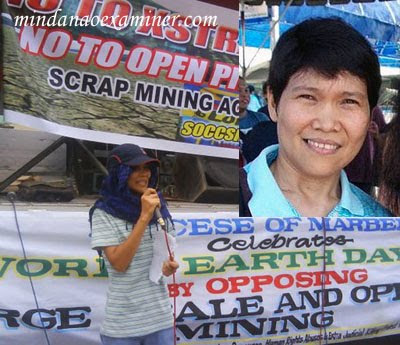 “Jean was merely there to share the experience of our own partner communities who are also facing the threat of coal mining and environmental degradation from coal-fired power plants. She entered Indonesia legally and was attending a legitimate activity organized by an internationally-recognized environmental NGO. Her arrest and the arrest of the other participants were completely unjustified,” Pasimio said in a statement released Tuesday. “Clearly Indonesia still hasn’t completely shrugged off its authoritarian past. This latest episode evokes the time of Suharto when the coercive power of the state, through the police and the military were used to sow terror and choke democratic space. This abusive behavior has no place in a supposedly democratic country,” Pasimio said. Pasimio’s associate, Erwin Quinones, said the Filipino woman and the others are still being held in Western Java. He said four Indonesian journalists who attended the news conference witnessed the arrests. “We are communicating with everybody about this incident,” he told the Mindanao Examiner.